What is Fake News? What is Propaganda? These and many more important questions are being answered by journalists and experts in this new series by Carlsen Verlag. 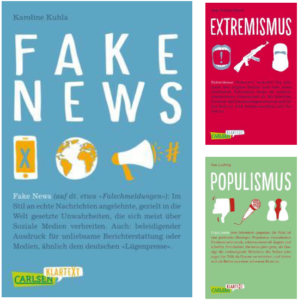 It is a non-fiction series focusing on current political and social topics initiating a thinking process and show that it is not difficult to form your own differentiated opinion about politics, social topics and the role of media. This entry was posted in Carlsen and tagged Carlsen, extremism, fake news, feminism, non-fiction, political, populism on 19th February 2018 by admin. Interactive adventure for young heroes!